Just as the original X-Men trilogy was built on the strength of Hugh Jackman, Patrick Stewart, and Ian McKellen, this latest series had the star power of Michael Fassbender, James McAvoy, and Oscar winner Jennifer Lawrence. But things have changed for them all since they first signed on to 2011's X-Men: First Class, inking a multi-picture deal that wraps up with this month's X-Men: Apocalypse. While McAvoy seems to be returning as Xavier, possibly in New Mutants, the latest comments from Lawrence suggest nothing is set in stone. So basically it's all or nothing. Fox may be willing to let them walk, just because the trio are going to be hugely expensive now, and the stories seem to be veering away from Mystique and Magneto. 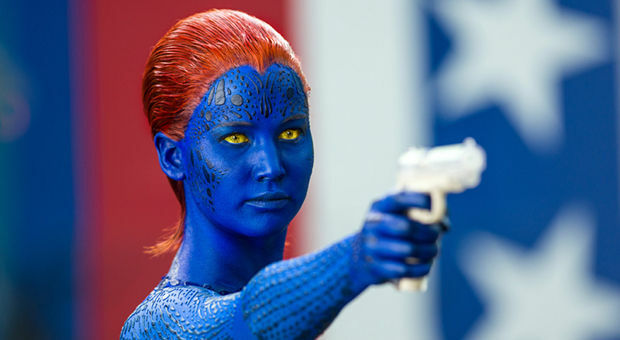 Lawrence, who has long stated her hatred for the blue make-up she has to wear for the role, is busy enough that she can afford to leave the X-Men behind. It's surprising there hasn't been any talk of a Mystique spinoff movie, which to me would be far more interesting than a Black Widow or Harley Quinn film.